Miller Dabbs wins bronze at BC Athletics JD Pentathlon! 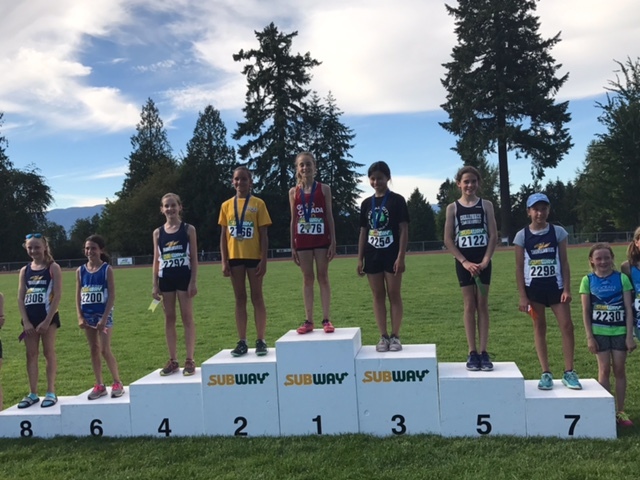 18 Thunderbirds took part in BC Athletics Junior Development Pentathlon Championships, held in Maple Ridge on Saturday, June 24th. Miller Dabbs highlighted the club's overall performances, earning the bronze medal in the boys 10 year old age category. Lucky number Seven appeared as the relevant favourite of the day, with six Thunderbirds finishing in this position in their respective age categories: Natalie Franke, Emily Franke, Gabriella Barton, Anna Kruk, Kai Martland, and Clarence Cheung. Sophia Aitken nabbed a sixth place finish, Krista Kruk finished fifth and Libby Dabbs just missed out on a medal with 4th in the 11 year olds girl's event. An eighth place by Nyla Tukker left the Thunderbirds with 11 top eight finishes…a very good record! Some great individual performances which stood out included: Sophie Aitken adding a huge margin to her high jump and long jump PBs; Libby Dabbs going under 11 seconds in the 60m hurdles, and adding PB’s in long jump and high jump; Emily Franke scoring three PB’s, a feat duplicated by Kate Logan and Chloe Symon; Anna Kruk and Miller Dabbs hitting 4 PB’s; Kai Martland dipping under 1.50 in the 600m and in doing so also scoring 4 PB’; and Gabbi Barton running a strong 600m for a PB also. Full results from the JD Pentathlon event can be found here. Next up for our JD athletes is the 4X100 relay event held during the SOLD OUT Harry Jerome International Track Classic on Wednesday, June 28th in Coquitlam BC.